LONGSPAN is available in POE and data-only models. This is the PoE version. IP cameras can demand peak network bandwidth of several times their average data rate while transmitting critical high-activity or low-light scenes. That's why LONGSPAN has been designed to support the full 200Mbps bandwidth required for reliable 100Base-T Ethernet at up to 840 metres Cat 6 (or 690 metres Cat 5e). For even more extreme distances, LONGSPAN can automatically negotiate a 10Base-T connection, supporting a range in excess of 1000 metres, over ten times the conventional limit for cabled Ethernet. 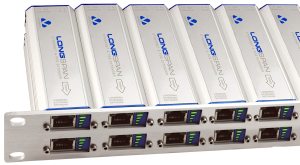 LONGSPAN models with POE can be powered from conventional IEEE 802.3af POE or 802.3at POE Plus switches and injectors, or Veracity's versatile power supply options can be specified for maximum range and power. Sites with legacy analogue cameras often use UTP baluns to send video over several hundred metres of twisted pair cable. LONGSPAN facilitates a simple upgrade path to IP for these installations. LONGSPAN can automatically detect and adapt to single-pair cables, and deliver the same uncompromised 10 or 100Base-T connection up to 900 metres, assuring predictable IP video quality each and every time. LONGSPAN's unique, expandable mounting system permits up to 24 channels to be mounted in just 1U of rack space, with configurable rear-mount power supplies available if desired. Smart diagnostic LEDs, including a SafeViewTM display on POE models, provide instant confirmation of cable-dependant power availability, and feedback of remote link status and other diagnostic information, for fast, confident installation.